Paige Deveaux, poet and Harvard professor, is tracking her husband Raf, who has vanished once again. Paige trails him to Houston, where he is holed up in a seedy bar, drunk and cheerfully ashamed of himself. He's very glad to see her: she's the only girl for him (and he should know--he's tried most of the others). Finding Raf is one thing, but holding on to him is another. To sober him up, to keep him sober, to keep him, Paige enlists Raf's old friend Raymond (himself an ex-alcoholic) and Raf's new friend Pru, a holistically inclined contortionist-stripper. For a while life, and Raf, seem to settle down. But this foursome is nothing but trouble for one another. Pru is a hit-and-run artist, a sexual desperado who has already broken Raymond's heart, and now Raymond is growing sweet on Paige. As Raf says, "Assorted wretchednesses ensue. 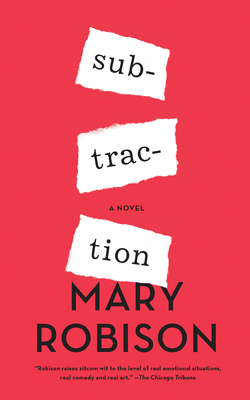 MARY ROBISON was born in Washington, D.C. She is the recipient of a Guggenheim Fellowship, two Pushcart Prizes, an O. Henry Award, the Los Angeles Times Book Prize for Fiction, and the 2018 Arts and Letters Award in Literature. She is the author of four novels and four story collections. She lives in Gainesville, Florida.